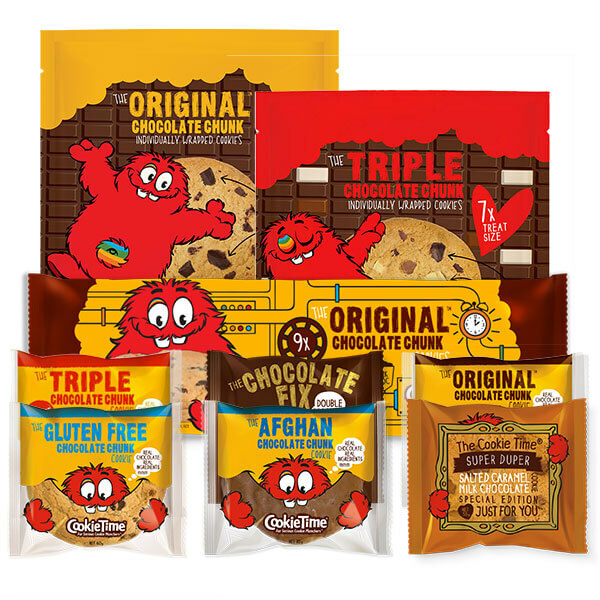 We're a family owned Christchurch company, founded in February 1983 with the delivery of 70 jars of Cookie Time® Original™ Chocolate Chunk cookies to 70 Christchurch stores. People quickly fell in love with this giant taste of happiness – and New Zealand's favourite cookies are now loved all over the world. Baked with a passion, our cookies are made with real chocolate and real ingredients. 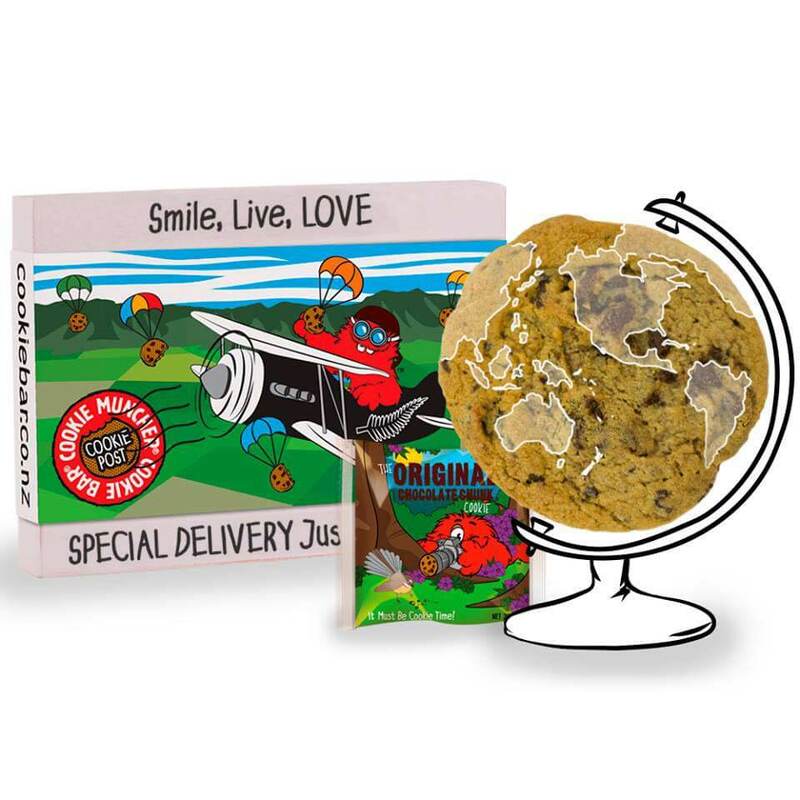 We have an ever evolving range of delicious cookie flavours and sizes, from our famous large cookies through to a selection of smaller size treats, all presented in vibrant, fashionable and fun packaging. From the get go, Cookie Time was created for serious cookie munchers; lovers of cookies who appreciate quality, taste and value, and know there's nothing like a cookie to remind us of the comforts of home. We also support the Cookie Time Charitable Trust, with over $2 Million raised to date to help New Zealand children discover their gifts. 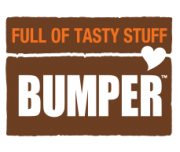 View our full range of products and their ingredients at Munch Time – our online store. Choose a cookie, compose your message, use one of our images or create your own and send your Postcard Cookie anywhere in the world. 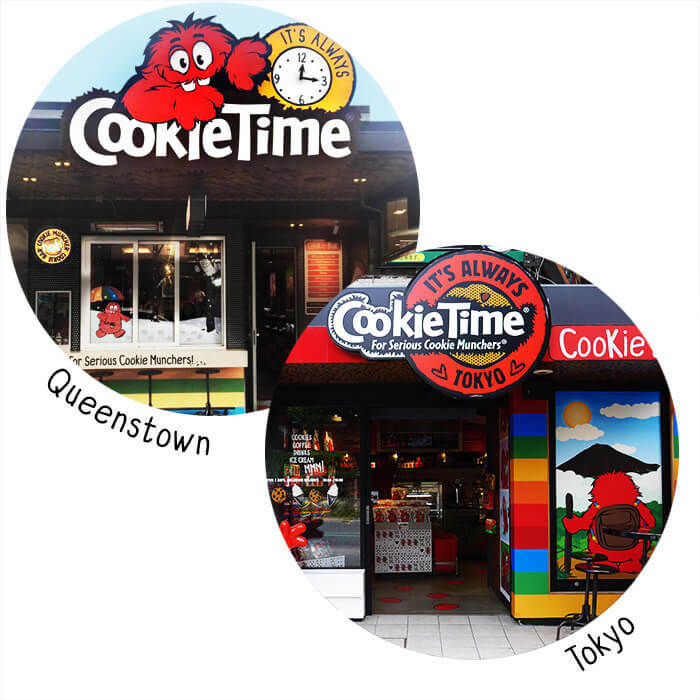 Experience a Cookie experience like no other at the Queenstown or Japan Cookie Bar. Each year the Cookie Time Charitable Trust receives a donation from sales of Cookie Time Christmas Cookies. To date, more than $2 million has been raised to support the Trust’s work. 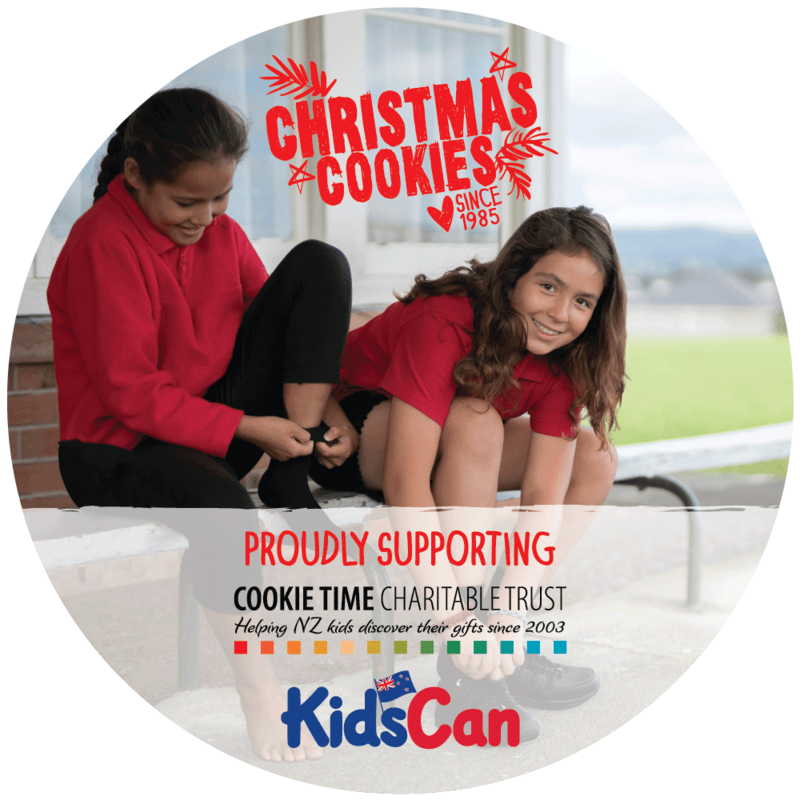 Cookie Time is aiming to raise $200,000 from 2018 Christmas Cookies sales, to support this year’s headline charity KidsCan, plus ongoing Trust initiatives. 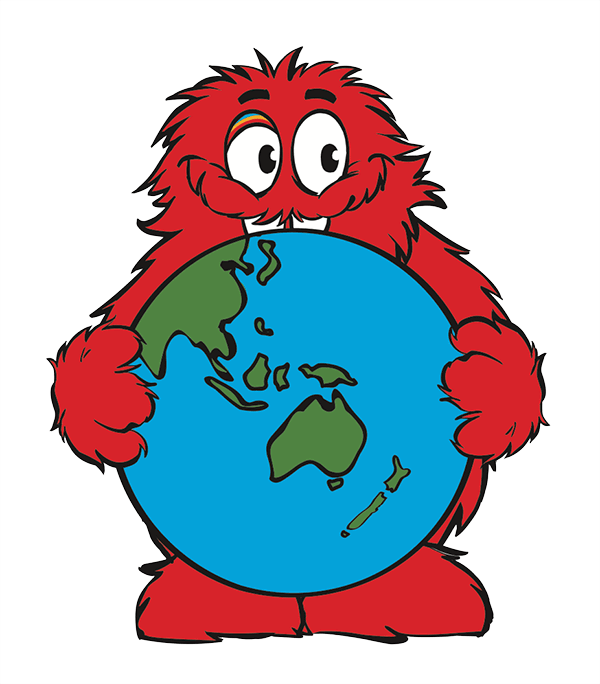 The Trust was established in 2003 to help New Zealand kids discover their gifts. It supports initiatives across three target areas: innovation in learning, thinking differently and physical pursuits. Highlights include funding the establishment and ongoing work of the Dyslexia Foundation of New Zealand. It also makes a range of grants to individuals and organisations; these have included support for anti-bullying campaigns as well as funding for physical pursuits from music and dance to ice-skating, karate and motocross. For more details, visit the Trust website. 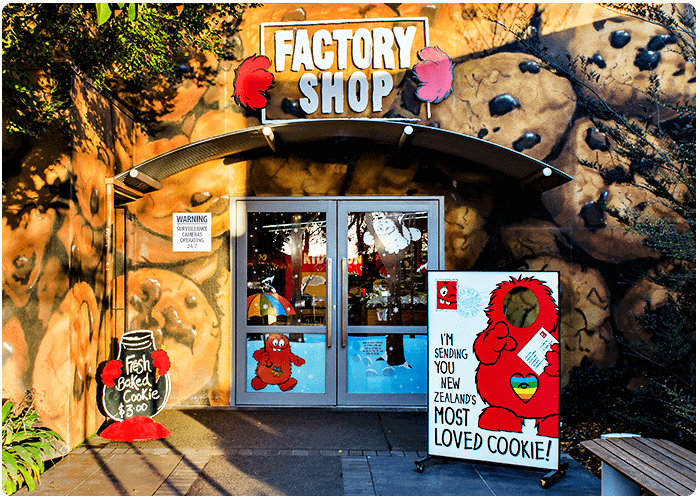 Located next to Cookie Time's head office and factory in Templeton, our factory shop is a cookie lover's paradise. Jam packed with great tasting products at great factory direct prices. 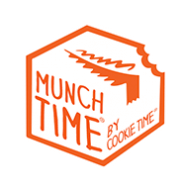 Plus a sweet range of Cookie Time branded merchandise, from Cookie Muncher soft toys, t-shirts, hoodies and jandals, through to drink bottles, phone cases, badges, stickers, pens and Postcard Cookies! The Cookie Time Factory Shop is located at 789 Main South Road, Templeton. Click here to view a map. Need to get in touch with the team at Cookie Time? You can either fill out the form or contact us directly using the below details. We’d love to hear from you. Where do you want your message to go? 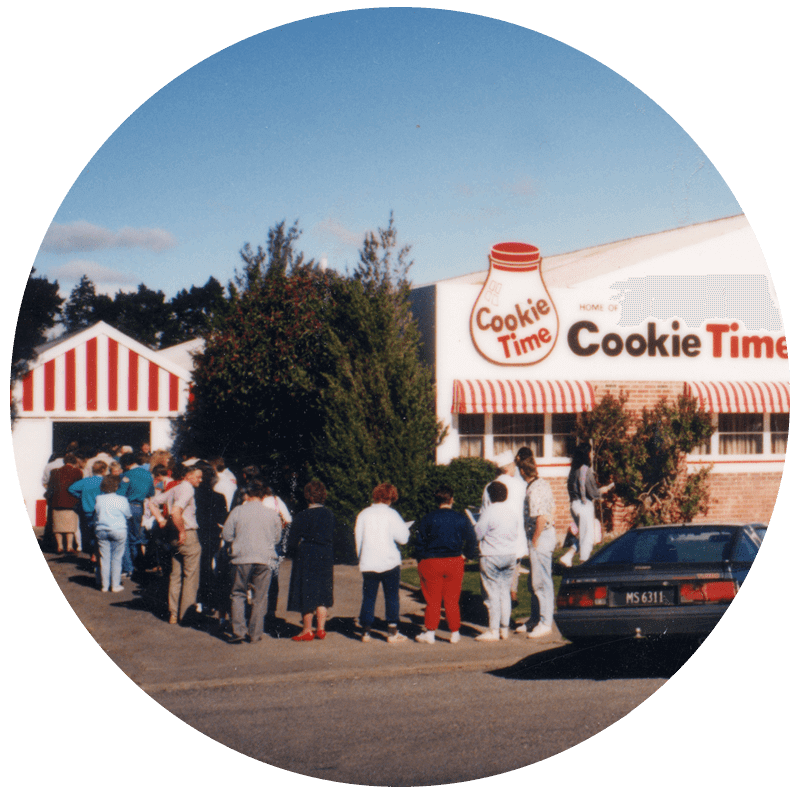 Cookie Time came to life on 1 February 1983, when 21-year-old Christchurch entrepreneur Michael Mayell and his mum delivered 70 jars of Cookie Time® Original™ Chocolate Chunk cookies to 70 Christchurch stores. By the afternoon, the phone was ringing off the hook with new orders – Kiwis’ love affair with Cookie Time had begun. Within a year, younger brother Guy had joined the business, and the business remains owned by the two brothers. In the early days, Cookie Time cookies were produced with classic Kiwi ingenuity. The chocolate was cut up on a customised bacon slicer to get big chunky pieces, cookie dough was measured out with ice cream scoops, and paint scrapers were used to get the baked cookies off the trays. Technology may have changed but Cookie Time remains committed to producing quality products with real ingredients. Cookie Time is passionate about cookie-loving experiences that inspire, engage and connect. People still talk about its ‘all you can eat’ factory tours in the 1980s. For 12 years, from 1996 through to 2008, it held the Guinness Book of Records for making the world’s biggest cookie. The brand’s beloved Cookie Muncher character remains a favourite for the kids and adults alike. With an ever evolving range of delicious cookies to choose from, you can be sure ‘It’s always Cookie Time.